Hailing from Koratty in Thrissur district, the 23-year-old now serves at the Kurungazhipp Bhagavathy temple. THIRUVANANTHAPURAM: Yadhukrishnan, who scripted history by becoming the first Dalit priest in the Travancore Devaswom Board, favours the restriction on women at the Sabarimala Lord Ayyappa temple. He said the restriction on women in the 10-50 age group was part of the custom and rites of the temple, he told Express. “Every temple has a pooja kriya (rites) fixed by the acharya who installed the idol. The customs and rites are decided as per the nature of the deity and none has the right to alter them,” he said. He said the ban for a section of women cannot be seen as a discrimination. “You cannot call it a gender bias because female children and women over 50 years of age can visit the shrine. In fact, the shrine is a unique place where there is no discrimination on the basis of gender, religion, caste or creed,” he said. He said the call to lift the restriction was not any “social reformation” but a blatant attack on the beliefs of a community. “A vast majority of the population wants the existing customs to continue. The remaining, mostly non-believers, are creating problems to violate the customs and visit the shrine,” he said. He said there were people who wanted to divide the Hindu believers. “There were false campaigns that I was treated bad by upper class devotees. In fact, they regard me well and often invite me to conduct classes on Hindu customs,” he said. He said there were efforts to divide the Sabarimala protestors on the basis of caste. 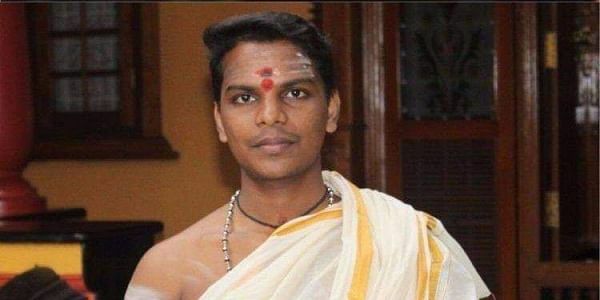 Hailing from Koratty in Thrissur district, the 23-year-old now serves at the Kurungazhipp Bhagavathy temple.